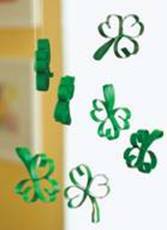 Don't forget that I have a bilingual St. Patrick's Day activity pack on sale in my TpT shop. It's perfect for children in Pre-K through 1st grade. Enjoy! 1. Cut four half-inch rings from a flattened cardboard tube, then cut through one of the folds on each ring. 2. For three of the rings, bend and glue the two ends to form a heart-shaped leaf. 3. Fold the fourth ring into a triangular stem and glue the ends together. 4. Glue the stem between two leaves, then glue on the third. 5. Paint the shamrock green. When it’s dry, hang it with fishing line or string. 2. Cut the shape from a piece of faux fur and a piece of corrugated cardboard (with the corrugations running vertically). 3. Glue the fur to the cardboard. 4. Place a bit of glue on the end of a bamboo skewer, then insert it into one of the center flutes of the cardboard. 5. Let the glue dry before employing the disguise. 1. Fill a small bowl with dip. 2. Slice four long strips of bell peppers in various colors and arrange them as shown. 3. Cut two small cauliflower clouds, skewer each with a toothpick, then position one on each side of the peppers. 4. Place sliced carrot coins beside the bowl for the leprechaun’s pot of gold.